(CNSNews.com) - Only the Federal Reserve owns more U.S. federal government debt than entities in the People’s Republic of China, according to the latest data released by the Treasury and the Federal Reserve. As of the end of August, according to the Treasury, entities in Mainland China owned $1,200,500,000,000 in U.S. Treasury securities. The only other nation that came close to that was Japan. Entities located there owned $1,101,700,000,000 in U.S. Treasury securities as of the end of August. Ireland was a distant third, with entities there owning $307,200,000,000 in U.S. Treasury securities. But the Federal Reserve here in the United States owned far more in U.S. government debt than entities located in any foreign land. As of August 31, the same date applicable to the foreign holdings cited above, the Federal Reserve owned $2,465,300,000,000 in U.S. Treasury securities, according to its weekly statistical release. As of Nov. 2, the Federal Reserve owned $2,459,827,000,000 in U.S. Treasury securities. As of Aug. 31, according to the Treasury, the total federal debt was $19,844,533,441,929. That included $14,381,561,995,497 in debt held by the public and $5,462,971,446,437 in “intragovernmental debt” (which is money the Treasury has borrowed and spent out of government trust funds such as the Social Security trust funds). The $1,200,500,000,000 in federal debt held by entities in Mainland China equals approximately 8.3 percent of the total U.S. debt held by the public. The $1,101,700,000,000 in federal debt held by entities in Japan equals approximately 7.7 percent of the total U.S. debt held by the public. The $2,459,827,000,000 in federal debt held by the Federal Reserve equals approximately 17.1 percent of the total U.S. debt held by the public. The combined $4,762,027,000,000 in U.S. federal government debt that is held by the Federal Reserve, the Chinese, and the Japanese equals approximately 33.1 percent of the total U.S. debt held by the public. Chinese and Japanese accumulation of U.S. federal government debt has tailed off in recent years. China’s ownership of U.S. government debt peaked at $1,316,700,000,000 in November 2013. Japan’s peaked at $1,241,500,000,000 in November 2014. 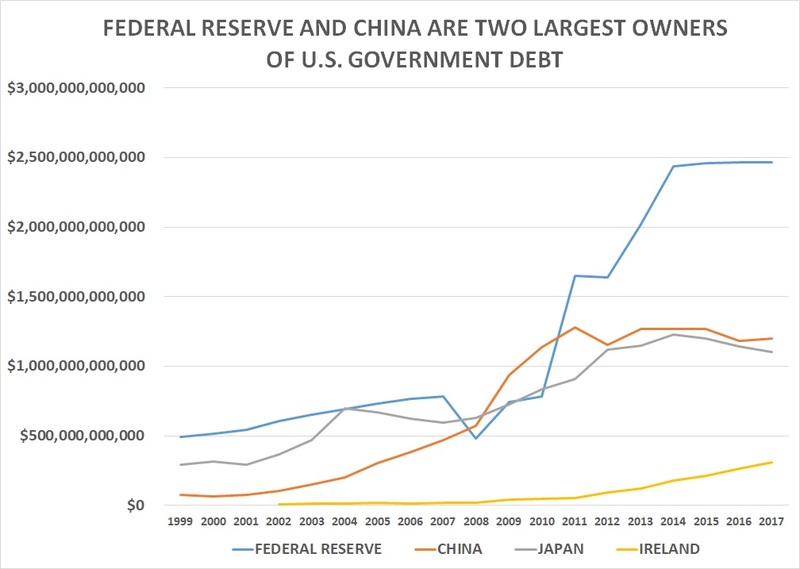 Even as Chinese and Japanese holdings U.S. government debt have tailed off, the U.S. government has continued increasing its debt held by the public. At the end of November 2013, when China’s ownership of U.S. debt peaked at $1,316,700,000,000, the U.S. debt held by the public was $12,281,126,257,987. At the close of business on Nov. 7, according to the Treasury, it was $14,823,047,871,224—or $2,541,921,613,237 more than when Chinese ownership of the U.S. debt hit its peak. Purchases by the Federal Reserve picked up for some (about 11.65 percent) of that slack. Its holdings of Treasury securities increased by $296,161,000,000 between November 2013 and now (rising from $2,163,666,000,000 to $2,459,827,000,000). The U.S.-China Economic and Security Review Commission, which was created by Congress “to monitor, investigate, and submit to Congress an annual report on the national security implications of the bilateral trade and economic relationship between the United States and the People’s Republic of China” issued a report in May on "U.S. Financial Exposure to China." “U.S. Treasury securities make up the largest category of China’s holdings of U.S. securities,” the report said.